#1 Niagara Falls Event Rentals Company - We are Niagara Falls largest event rental company offering a large selection of equipment and services for wedding and party planners. We help create the perfect experience by providing high quality equipment including Tents, Tables, Chairs, Lighting, Stages, Lounge Furniture, Red Carpets, Pipe & Drapes for small and large venue events in Niagara Falls. We provide rental for events in Niagara Falls including full delivery & installation services. We offer curtains and drapes rentals for a variety of events. Our drapes and curtains come in my different heights and length. We rent curtains for weddings, tradeshows and corporate events. We have a variety of curtain colours including red, black & white. Our drapes are supported by strong light weight pipes that can connected and used for many purposes. We have drapes and curtains for a variety of events including weddings, private parties and corporate events. 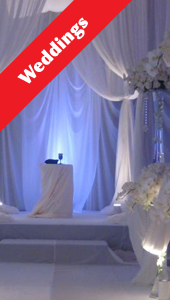 Use our pre-built wedding back drop drapes for your wedding. Choose from a variety of styles and setups available. We have portable rooms and booths that can be used for change rooms, interviews, photo booth and trade shows. Looking for a portable stage to rent for your next event. 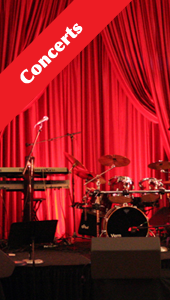 We have the largest selection of stages, stage steps, stage roofs, stage lights and more. Rent our indoor stage or outdoor stage. Each stage is design perfectly for your event. 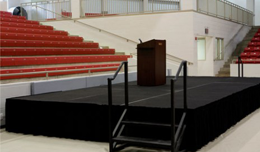 We offer stages with non slip surface and stages with protective roofs. 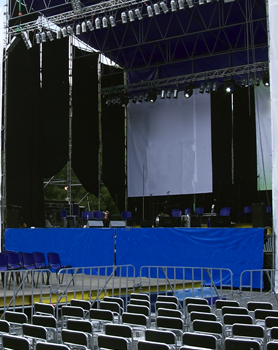 We have portable stages for shows, concerts, and performances. We carry a large selection of high quality designed stages used for weddings and fashion shows. Use the true celebrity red curtains made of velour and medium weight. 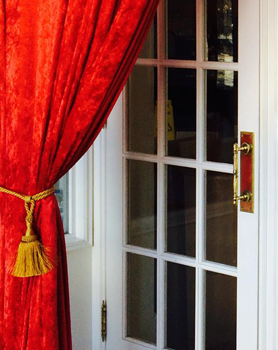 Highest quality red curtain entrances available. 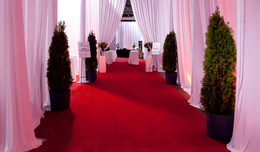 Our authentic red carpets are used for tiff and hollywood stars at premier events. Use our true celebrity red carpet runners. 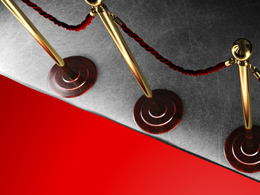 Complete your red carpet entrance with our gold stanchions and red velour ropes for you VIP guests. 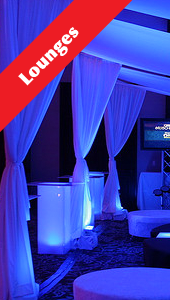 We offer wedding and party wall up lights for events in Niagara Falls. Our wall up lighting come in a variety of colours and setups. We have a large selection of string lights for weddings and events including globe lights, lantern lights and curtain lights. 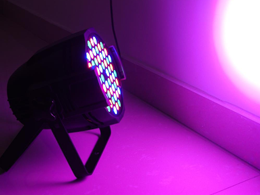 Our DJ party lights are perfect for dancing and creating that amazing vibe. We have intelligent lights and LED lights. We offer curtains and drapes rentals for a variety of events. Our drapes and curtains come in my different heights and length. We rent curtains for weddings, tradeshows and corporate events. 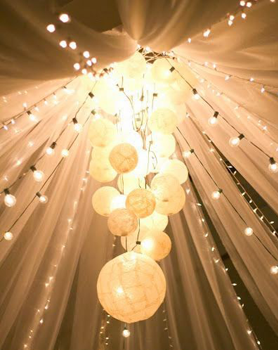 We offer a vast array of portable lights for weddings, birthday, DJ Parties, Staging and more. 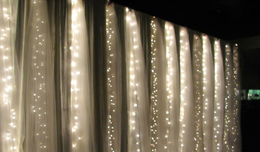 Wedding Curtain Lights, Christmas Party Lights, Outdoor String Lights. Niagara Falls fashion show rentals and stages available for rent. We have the largest selection of fashion show catwalks and stages. Rent our fashion show stages and catwalk in Niagara Falls. 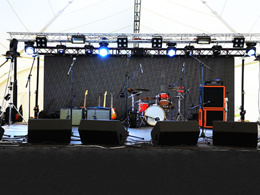 We offer a large selection of portable stages, risers and custom stage rentals. We have a variety of stage sizes and heights available for your corporate event. We offer wireless microphone systems for rent in Niagara Falls. We have premium wireless mics systems for shows, concerts, music, conferences and private parties. Hand helds, Headsets and Lavalier Wireless Microphones in Niagara Falls. Our carpet is the authentic red carpet used by events and venues for celebrity appearances, VIPs , public figures, and international diplomats. We are Niagara Falls largest supplier of folding chairs and folding tables. We offer wedding chairs and wedding tables for rent in Niagara Falls. We have black and white folding chairs available. We are Niagara Falls largest supplier of outdoor framed tents for rent. We have a variety of different tent sizes for backyards, parks and corporate events. We have large framed tents for weddings. Looking to rent furniture for your next event? We have lounge furniture, club furniture, outdoor furniture, home staging furniture for all events. Niagara Falls table, chairs, and furniture rentals. Food and beverage equipment rentals. We are Niagara Falls leading provider of buffet and catering equipment rentals. Rent our food warmers and buffer serving equipment for your next party. Niagara Falls Dance Floor Rentals for weddings, parties, performances and corporate events. If you are looking to rent dance floors in the Niagara Falls area we can provide you with our portable dance floors. We carry a large selection of rental equipment and accessories in the Niagara Falls area. We are Canadas leading rental company providing services to 1000s of events each year in Niagara Falls.